Yes, I know this is a political post, but a matter of this magnitude requires us all to speak up in defense of our California “brothers and sisters in arms”, as it were. Some gun pundits (“gundits” - did I just coin a term?) suggest that the Californians have chosen their lot in life and that us gun owners in more fortunate states should just let them be, i.e. it’s a state matter, and so on. However, this is not necessarily true. California’s government is disproportionately tilted towards the hyper-liberal urban areas of Los Angeles, San Francisco, and Sacramento, all bastions of Big Government, “progressive” thought, the Hollywood elite (“guns for me but not for thee”), and social justice warriors. However, California as a geographic whole is a very large state, with a good percentage of the population living in suburban and even rural areas, where gun culture is alive and well. Already, California had a strict gun control regimen. Concealed-carry permits are “may-issue”, which basically means that even if you meet the basic requirements of being issued a concealed-carry permit, the local chief law enforcement officer (yes, the infamous CLEO), can arbitrarily deny your right for any reason he or she feels. Certain guns that the California government deems an “assault weapon” cannot be sold within the state to civilians. All .50 BMG firearms are prohibited. Any magazine sold in the state after January 1 2000 must be 10 rounds or less. Possession of NFA items is prohibited unless you work in the film industry and your corporation has a “Dangerous Weapons Permit”, again “guns for me and not for thee”. Person-to-person private sales are prohibited. There’s a 10-day waiting period for all firearm transfers. All firearms sold legally are registered with the state. A judge can order your guns seized without any due process. There’s a roster of “approved” handguns which manufacturers must pay a fee of thousands of dollars (per model) to get on in order to be approved for sale in the state. Rifles sold in the state cannot have an easily-detachable magazine, which led to the development of the Bullet Button tool. California has gun control in spades. Wikipedia has a good good run down of the gun laws in California. However, a few weeks ago, it got worse. A series of new laws, drafted in response to the San Bernandino incident back in November of 2015 (i.e. the politicians had to “do something”) termed “Gunmageddon” were almost unanimously passed by the California legislature. Things got even worse in the Golden State. A few weeks ago, 7 new major gun control laws were signed. None of which will accomplish anything but inconvenience law-abiding citizens. Expand the definition of “assault weapons” and ban their sale or transfer - this basically bans a slew of firearms in California, and also bans the “bullet button” magazine release mechanism. Require an ID and background check to purchase ammunition. Yes, if you want to go buy 50 rounds to practice with your pistol, you’ll have to undergo the state equivalent of a NICS check. The government will know you just purchased 50 rounds of ammunition. Keep records of gun owner’s ammunition purchases. The California government will know how much ammo you may have. Require a background check to loan a firearm to someone other than a close family member. If Uncle Bob wants to borrow your gun at the range, technically he’ll need to get checked out. Ban possession of ammunition magazines that accept more than 10 rounds. Even simple possession will be a crime. Make it a misdemeanor to knowingly make a false report that a firearm has been lost or stolen. Require a serial number on all firearms. If you 3D-print an AR lower, you’ll have to serialize it and register it with the California state government. You can find a more detailed rundown here. None of these laws address the fundamental issues of societal violence. If someone wants a gun, they’re gonna get one. If they can’t, they’re going to find another object by which they can effect lethal force. Knife, bat wrapped in barbed wire, katana, take your pick. However, this logic didn’t prevent the California government from passing this package of laws, again under the guise of “doing something”, because their careers depend on “doing something”. The people behind the scenes keeping these legislators employed wouldn’t have it any other way. The US as a whole had a package of restrictive gun laws for a period of 10 years. From 1994 - 2004, the Federal Assault Weapons Ban was in effect. The ban only addressed firearms based on appearance, not caliber or functionality. An AR-pattern rifle could be banned simply for having two or more “scary” features such as a flash hider and a pistol grip. Crime declined during the AWB years, sure, but further research deemed that it declined no more than it would have with no AWB. Most crimes with a firearm involve handguns. Handguns, being easy to conceal and dispose of after a crime, are “too hard” for the government to deal with. Rifles, especially AR-pattern ones, are the low-hanging fruit. At the time, not many people had them, and the politicians could “do something” and get re-elected. Tough on crime and all that. Ironically, the AWB, once enacted, prompted the first rush on AR-15s, as people wanted to get theirs before the ban took effect. Thankfully, the federal AWB expired in 2004. The expiration actually prompted an explosion in the AR industry, with new manufacturers commencing operations at a breakneck pace. Where once only a few players (mostly firms like Colt, Armalite, and DPMS) existed, suddenly thousands of firms were crafting and assembling AR-pattern rifles. The laws, especially after expiration, did nothing but spur innovation and new markets. Nowadays, everyone has or wants an AR. Why should I care? I live in a red state that hasn’t elected a Democratic governor in 60 years! Well, simply put, just because your state is gun-friendly doesn’t mean it will stay that way. The major Bloomberg-financed anti-gun organizations (yes, they are anti-gun - “gun safety” is just a way to sell the idea to fence-sitters…) have chapters and foot soldiers in all 50 states. Even Texas has anti-gun people. And the balance of power in government can change from year-to-year. A solid conservative state can go centrist or full neoliberal over the course of a year. And bad ideas are viral. The playbook that anti-gun organizations operate from includes “success stories” like California, New York, and New Jersey. And surely they are adding new chapters to include concepts from Gunmageddon. Also, gun control never stands still. It’s the ultimate example of legislative creeping incrementalism. The federal laws concerning guns are the perfect example. The first major gun control package in our nation’s history was the National Firearms Act. I went over this in my analysis of ATF 41F, but in short, the NFA as signed off by Roosevelt, the God-Emperor of Democrats, heavily restricted machine guns, short-barreled rifles and shotguns, suppressors, and “any other weapons” (disguised guns, etc…) in this country via an oppressive tax. Following up that wonderful piece of legislation was the Federal Firearms Act of 1938 which laid the foundations for the FFL system, which basically meant that guns could only be sold by licensed dealers that went through an onerous application process. And yet, the government wasn’t done “doing something”. 1968 saw the Gun Control Act of 1968. Borne forth by President Lyndon Johnson, a Democrat (Dems have a thing about attempting gun control…), the GCA established the FFL system full-force and also imposed restrictions on importing arms with no “sporting purpose”. If you wanted a slick H&K rifle, you were pretty much SOL unless it was significantly modified for US import. The Act also represented the first time the NRA seriously kicked back at the government, as the original law called for national registration and licensing of all gun owners. In the 1980s, they got crafty. The Firearms Owners Protection Act, ostensibly to undo the more onerous provisions of the GCA, had a last-minute amendment tagged on to it, by Democrat William J Hughes of New Jersey. The Hughes Amendment, as it was called, was passed by a controversial voice vote, and subsequently banned the sale of newly-built machine guns to civilians after May 19th, 1986. Machine guns were already restricted by the NFA (subject to registration and transfer taxes in addition to a background check) and rarely used in crimes, so this amendment was an example of “doing something”, again. 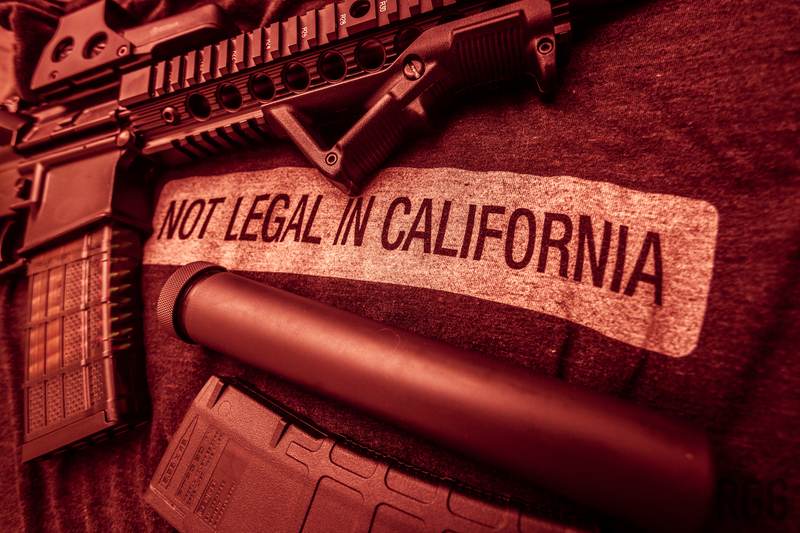 The 1990s saw the aforementioned AWB, and many attempts since then have happened to restrict firearms at the federal and state level, including California’s Gunmageddon. This is what they call creeping incrementalism. A little restriction here, a little restriction there, and suddenly your long-cherished rights are curtailed extensively. It’s happened to us here in the United States, and one only need to look to the United Kingdom to see an extreme example. Firearms at the beginning of the 20th century were relatively unrestricted in the UK, but gun control laws passed over the course of a century have effectively nullified gun ownership in the land of Hope and Glory. Because no one noticed as it was done bit by bit. This is why we resist gun control at all levels. It’s not because the law itself is harmful (well, it is…), but because it’s just part of the larger puzzle. The endgame is confiscation. Several organizations have taken up the torch to defeat Gunmageddon. Yes, we were talking about that! The NRA-ILA is always accepting donations. They have been focusing on California as of late. Any amount helps. A more localized effort is via Veto Gunmageddon. It’s grassroots, and the money goes to help people on the ground over there. Also, if you live in California, make sure to sign their petition so the Gunmageddon laws are put to a referendum by the people of California. The Calguns Foundation is standing by as always to take on the challenge. They are worthy of our support. Gun control laws as it stands are pointless. California’s law-abiding gun owners are the ones who will suffer the consequences of these bills. It’s up to us to help them. They can’t fight their government alone. Donate. Encourage education. Point out that you can’t “stop the signal”. Gun restrictions breed defiance, and the manufacturing gap is closing. A working AR-pattern rifle and magazine (of almost any capacity) can be 3D-printed and milled at home these days. Those files are available the Fosscad Repo if anyone’s interested. A working gun control framework that suppresses this sort of information would effectively nullify the Bill of Rights as a whole. A respect for gun rights is a litmus test for a respect of freedom. Those who do not respect gun rights, do not respect freedom, even if they do so unknowingly. It’s up to us Regular Guys and Girls (and not-so-regular guys and girls) who own guns to get out there and educate.